We have a marketing company. If you are an agency of any size and work with clients, it's easy to give your clients full access to whatever you want them to see. We allow our clients to see how their projects/tasks are going, but there is even a hidden from clients button on any task that allows you to give full visibility into any task for any and all clients. Our main goals were to drive value by focusing on adoption by all, increased visibility in spend, and compliance. Coupa is very easy to use and does not feel like an ERP. Our end users like the easy to use, intuitive interface. A side benefit that we have experienced is that we were able to get rid of a shadow system that our IT department was using to track spending. They are able to use Coupa to track committed and actual spend and reconcile it their budgets and forecasts. Very nice interface for all user roles in the system. Effective notification of pending tasks and optimal management of the equipment. Organized work flow, productive tasks and correct execution. Creation of filters to better locate artifacts for daily use. Key feature for our organization is to control and manage spend. Tracking budget and seeing insights into how our organization is spending money is critical. Ease of use was crucial for all end users. I can submit invoices and track where they are in the process easily. It is confusing when a review is made, before buying the product. It lacks animation and pleasant forms for the user. Does not allow effective communication when activities are reported. Since it does not provide a direct message chat. The reports that are generated are basic, they do not have personalization characteristics. Coupa supports flat file integration out of the box, but we wanted dynamic integration with NetSuite. This was not easily accomplished and we needed to hire another company called SuiteSkies to handle this real time integration. Coupa was missing the ability self service supplier maintenance and onboarding. Coupa was willing to listen to me and several other customers. They asked me to join a Customer Advisory Board that helped provide feedback and ideas on how to deliver a new module called Supplier Information Management. Certainly, each of them has a particular advantage, which in the end makes it unique. ActiveCollab also belongs to a group of platforms created to be represented in particular, its way of project management is superior to JIRA or Trello. With this software, the work is more controlled and organized. Coupa fits within our desire to have best of breed systems delivering value to our organization. We generally work with true cloud providers that are available anytime, anywhere for our mobile workforce. We are pleased that Coupa is in our lineup of service solutions. ActiveCollab allowed me to get rid of spreadsheets and physical reports that always take away a lot of time. The automation of the management processes of the company is fantastic thanks to ActiveCollab. The whole team has focused more on the execution of its activities. Timer App The Timer is your stopwatch for tasks. 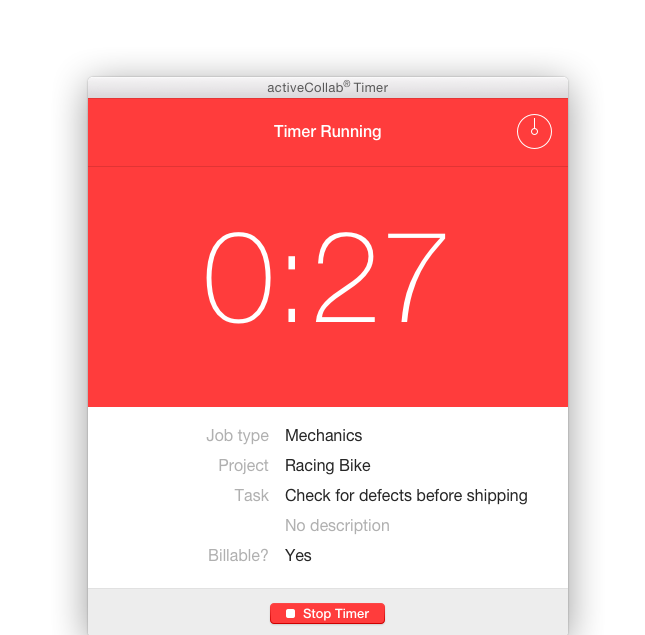 With a single press of a button, you'll be able to track time and then send it to ActiveCollab.